He was near the top of every coaches hot seat from the beginning of the year and probably the lists from last year as well so it wasn’t too much of a surprise when Papa Dodge got canned yesterday morning. It was damn near expected. We won’t be able to accurately put into perspective his career here. It is one for the record books and very memorable, mostly for being so poor. Six wins and thirty-seven losses. From all reports, the guy was as nice as can be. People called him a class act. That just doesn’t matter a whole lot. Where does classiness rank in the attributes-you-want-your-coach-to-have list? Somewhere after game management, people skills, talent evaluation, game planning ability, and general football knowledge, I would think. Maybe if you are a big time booster, and want to be coddled and have the head coach joke with you, humoring your football knowledge, nodding when you suggest that they “go deep” more often as if they are seriously considering this new tidbit of knowledge that was heretofore un-considered. I suppose you would put classiness pretty high then. Maybe if you like post-game shows filled with classy excuses. You like the coach to sound resolute yet tinged with the right amount of regret and shame. Maybe if you like him to talk about how much he loves his players. Maybe you just want him to look like someone you would want to send your kid to play for. Maybe if you are building a stadium. I don’t know. I have never had to schmooze donors for donations to the program. If that was our only goal, then Todd Dodge was an awesome hire. I am sure there were other ways to do it, however. I am also sure that Todd Dodge was not an awesome hire. Six wins and thirty seven losses. That is a horrible hire. I would even go so far to say that classy speeches to the post-game guy shouldn’t be applauded, but expected. Where is the ‘Act like you’ve been there before’ crowd when it comes to that? He gets no tears from me. In fact, I am tempted to talk more crap about Dodge-y because he has such staunch defenders. Firing him is not a shame. His record is. It is proven to be shameful. Go around and talk about the Mighty Mean Green from North Texas and see the ridicule it attracts. That, my friends, is shame. Let’s sum up his career without bringing up a whole lot of Wade Phillips-like stat pointing, shall we? Despite being heralded for his record and his offense in high-school , Todd Dodge failed to bring anywhere near that success to the college ranks despite competing in the worst conference in the nation. Dodge’s teams often looked unprepared and overwhelmed by the opposition, and by circumstance. Pretty much sums it up, eh? I think so. What about him? 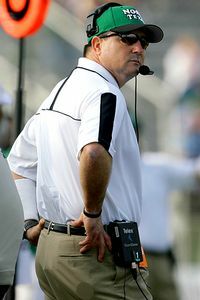 He is arguably the best Athletic Director North Texas has ever had. Under his watch, every program except football has done well. So, he has more wins that losses in his column. I will say, that like coaches who rack up a lot of ‘meaningless’ wins and fail to come through in the big games, RV will be judged by the fate of the football team. No one cares about the volleyball team except the nine volleyball fans and the parents of the players. Whether that is good or right is something for another time. The most obvious and most often cited criticisms of Rick’s performance is, of course, the fact that he hired a High School coach in the first place. Judging him by the results only, it is easy to take points away from him for that. Those deductions are mitigated by the circumstance, however. Just as Todd Dodge got some free passes for the circumstances of the program as he found it, so too will RV. At a school with a pitiful endowment (insert jokes here), the hire was not so stupid as it looks now. Todd Dodge was becoming fairly well-known nationally. He had an offer from Bill Parcells to be a Tight Ends coach. Would be a big splash. Had a new-fangled (at the time) spread offense at a time where we needed some offensive inspiration. Wanted to wait until the championship game before coming over. Those cons weren’t so negative when looking at them through the light of 2006. “Todd Dodge seemed almost too assured of himself” — Well, why wouldn’t he? He has won 79 of 80 games the last few years. Maybe he knows what the hell he is doing. Wanting to wait? I suppose that is not that big of a deal. Perhaps it shows his commitment and loyalty. The inexperience? Hurm. That was a big one. Not a deal breaker, but definitely a red flag. The fact that he wanted his high school coaching staff? That was definitely a big deal and still is. I don’t pretend to know what the situation was that led RV to stamp the OK on that request. I will say that if the financial situation is as dire as it is made out to be, then it may have all been a gamble with an eye on saving money. So I respect him for taking a calculated risk. I perfectly okay with such things. The next choice will be telling. Armed with the Neinas report and the new stadium I expect a turnaround.